A Terrell Bell three-pointer tied the game with 4:40 to go and propelled a 17-7 game-ending run that lifted Virginia Tech to a 64-60 upset of top-ranked Duke before a frenzied Saturday-night crowd at Cassell Coliseum. Tech (19-8, 9-5 ACC) had led most of the first half, but Duke (26-3, 12-2 ACC) closed to within 33-31 at the break with a late 9-4 run. A 10-3 Duke run made it 53-47 Blue Devils on a pair of free throws from Kyle Singler at the 7:44 mark. A Jeff Allen three with 6;34 to go closed Tech to within three. After a Nolan Smith jumper pushed the Duke lead back out to five, a Victor Davila dunk got the crowd energized, and then Malcolm Delaney rebounded a missed Smith layup, dribbled upcourt and found Bell in the right corner for the open three that tied it. A pair of Bell free throws gave Tech a 57-55 lead with 4:19 to go. An Allen layup at 2:39 made it 59-55 Tech. Singler answered with a layup at 2:29 to bring Duke back within two. Delaney hit a contested three from the left wing at the 2:02 mark to make it 62-57 Tech. 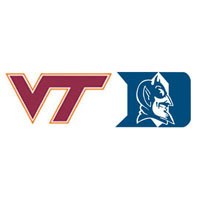 Duke would close within two at 62-60 on a free throw from Miles Plumley with 23 seconds left, and the Blue Devils had a chance to tie it after Allen missed the second of two free throws a second later, but Seth Curry, the son of Virginia Tech hoops legend Dell Curry, turned the ball over trying to set up for a three-point shot with five seconds left. Allen made one of two free throws with two seconds to go to seal the deal. The win is the first high-profile win for Virginia Tech, which has been teetering on the NCAA Tournament bubble in recent weeks.